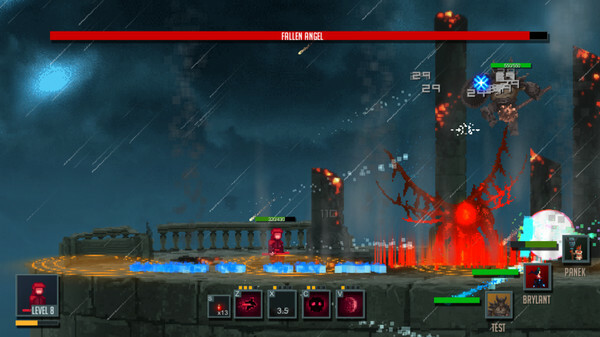 Warlocks vs Shadows blends frantic brawling action with RPG elements and is coming to a ton of systems when it’s released later this year. PC, Mac, Linux, Xbox One, PS4, PS Vita and Wii U owners can all look forward to this game by the small Polish studio Frozen District. Currently in early access and sporting that retro 8bit-esque look that’s been popular lately, the game already shows its multiplayer potential – with both co-op and versus modes included. RPG elements (including a basic loot system) mix up the battles as well, since powering up a certain way can turn the tide early on. Too early at this stage, because the game still suffers from balancing issues (including severely over/underpowered characters) – though there is plenty of time to fix these issues. On the plus side, the characters we got to play with already show great variety and thus offer tons of gameplay styles. This translates well into the single player (campaign) mode as well, with challenging boss fights being the central focus and highlight. Boss fights are challenging, and the game provides you with several ways to take them down – depending on the character you’re currently playing with. The balancing issues mentioned above don’t plague the single player mode as much either, so we had a better time playing solo for the majority of our playtesting. The levels that lead up to the boss fights, however, aren’t as exciting to play as the boss fights themselves. With the developer’s ambition to create an experience that blends several different gameplay styles, there’s no reason to assume this – too- will be expanded upon in the future. It’s always fun playing games like this at an early stage. Though plenty remains to be done, we’ve already seen some good mechanics at play and we’re looking forward to seeing how the game develops further!